Have you ever been to the library at UB? The Langsdale Library is currently located on the third floor of the Learning Commons. Is this your first semester at UB? Are you looking for the Learning Commons? Check out the building with the huge front yard, called Gordon Plaza, where you’ll see a statue of Edgar Allen Poe. You’ll see trees and flowers, too. You may notice benches where you can take a study break and picnic tables where you can eat lunch after a productive morning in one of the library computer labs. The library also has study rooms in addition to large open areas with big tables where you can spread out your books in front of expansive windows with lots of natural light and a great view of the city. Feel free to bring your laptop and write a paper sitting by the inspiring panorama. You can also a borrow a laptop from the library for up to four hours at a time, as long as you use it in one of the library’s comfortable study areas. Are you spending all day at the library or just running in to borrow books and DVDs? Lock your bike at one of the racks on Gordon Plaza right in front of the Learning Commons for a minute, an hour or an afternoon. It’s free to check out DVDs from the library and free to park your bike on campus. Just bring your Bee Card to check out books and DVDs. The library is open until 10 p.m., Monday through Thursday, for late-night studying and last-minute checkouts. The library’s Lunch and Learn program will be returning. Come to the library when UB professors discuss the results of their research. Feel free to ask questions and engage in the discussion. On Aug. 27, the library’s popular Cupcake Social returns for one hour only! Be sure to be there from 3 p.m to 4 p.m. All students are invited. Academic Search Premier, one of the library’s most-used databases, is now called Academic Search Complete. Writing Wednesdays, a new UB project, is a collaboration between the Writing Center and the Langsdale Library which will include workshops, appointments and walk-in sessions. The program will begin this semester. Keep a lookout for details. Do you have old tapes you want to preserve or convert? Learn how in Making the Overwhelming Possible, a workshop co-hosted by Langsdale Library and Digital Maryland on Sept. 25 in the Learning Commons Town Hall. For more information visit http://www.digitalmaryland.org/conference/. 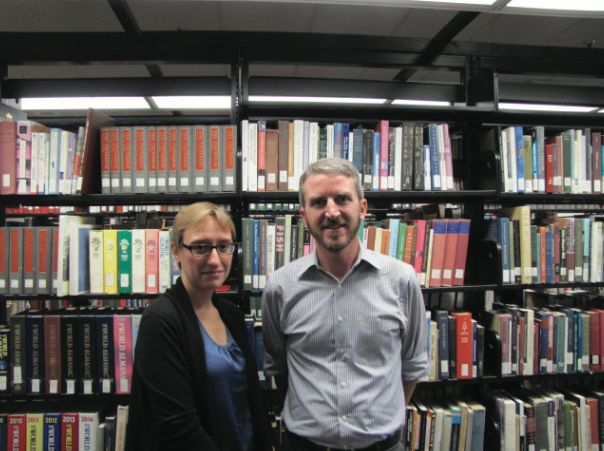 Meet the library’s new faculty: Resource Sharing Librarian Sean Hogan, Cataloging and Metadata Librarian Maggie Dull and, Reference and Instruction Librarian Bess Beck. All will be happy to answer your questions when working the library reference desk. Monday to Thursday 8 a.m. to 10 p.m.
Saturday and Sunday 10 a.m. to 7 p.m.